Tuesday, Thursday, Saturday 10 -11:15 a.m.
Yoga classes meet outdoors on the Lakeside Terrace when the weather is good, which is most of the time. If it is raining or too hot or cold, we meet in the Nature Chapel. CHAIR YOGA Tuesday Noon. Mixed levels. All welcome. Chair yoga meets in air-conditioned indoor space. Chair yoga can improve your strength, flexibility and balance – without getting down on a mat. It’s a gentle but thorough class accessible to anyone -even if you have balance or mobility issues. Usually, Monica leads most yoga classes. Linda teaches Saturday. Questions about yoga in general or chair yoga or Prime of Life Yoga ® ? 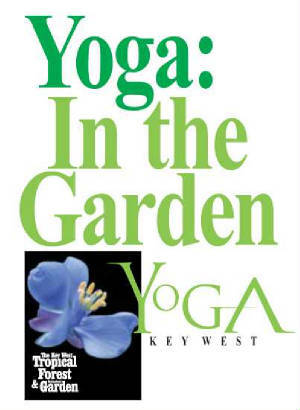 You can call 305-304-5635 or e-mail me monica@yogakeywest.org - click below. For special events, like classes accompanied by live acoustic music, check FaceBook for details. Days and times not right for you? Let us design a new recurring class for your group of three or more. Purchasing a Prime of Life Yoga ® class includes FREE admission to the Key West Tropical Forest & Botanical Garden for the entire day. It is the only frost-free botanical garden in the United States, and emphasizes cultivation and conservation of threatened and endangered species of the Florida Keys. It showcases plants native to South Florida, Cuba and the Caribbean.